APT Hostess Riza Santos wants you to tune in tomorrow. That will do it for Day 1a of the 2009 Asian Poker Tour Philippines Main Event. Seventy five players turned up today to try to parlay their $2,700 entry fee into a six figure payday and poker glory and immortality. By the end of the day a mere nineteen remained. Norihito Suzuki jumped out to the early chip lead and held onto it for most of the day, but lost a big pot to local Neil Arce in the last half hour of play. 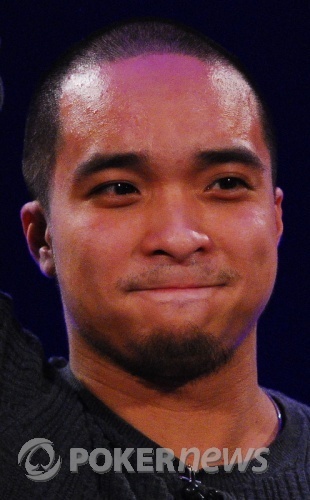 Arce is the apparent overnight chip leader with 85,800 chips. Two WSOP bracelet winners were in the field to start the day, but neither one made it to the bag-and-tag at the end of the night. 1990 WSOP Main Event winner Mansour Matloubi went out early in the day; Seven-Card Stud champion Toto Leonidas held on for most of the day, succubing in the last ten minutes of play. Tomorrow's field promises to be much larger than today, and will be stocked with talent well-known to the international poker circuit. PokerNews will have all of the action live from the tournament floor at noon local time. Until then, good night! World Series of Poker gold bracelet winner Toto Leonidas is out. Short on chips, he took a preflop race from the small blind against big blind Casey Kastle. Leonidas had the red eights against Kastle's and came in second on a board of . Leonidas' chips moved into Kastle's stack as Leonidas moved out the door. We caught the action on the flop of with 9,000 in the pot. Norihito Suzuki led out for 4,500 and Neil Arce made the call. The turn fell the , and Suzuki led for 5,000 with Arce quick to enter the pot behind him. The river landed the and Suzuki continued his aggression by firing 10,000 into Arce. Arce snap called behind. Suzuki tabled for top pair, but Arce's was good enough to scoop the pot. It also pushed him up to chip leader with 89,000 while Suzuki slipped to 78,000 in chips. Anders Andersson is flush with chips after a hand against David Welch, but he's redistributed a few of those chips to Christophe Petitclerc. Andersson check-called a bet of 2,200 in a three-way limped pot on a flop of , then check-called another 4,800 when the turn fell . He check-folded to a 7,600 bet on the river. "I had a lot of outs," replied Andersson. David Welch raised with air and got caught. He and Anders Andersson went to war on the turn of a board. Welch was the first aggressor, making it 3,500 to go. Andersson responded by raising to 11,500. Welch thought things over, then put in another raise by matching the 11,500 and sliding a stack of yellow (1,000) chips out across the betting line for a total bet of 31,500. 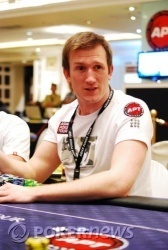 Andersson responded by moving all in for 35,700. Incredibly, Welch went into the tank! "How much is it?" he asked the dealer. "I don't think I can call." The dealer informed him the raise was 4,200 more back to him. "I can't call!" said Welch. "I've got nothing." He shooed away a massage therapist that was giving him a massage so he could figure out what to do. Finally he decided that he could indeed call and made the call with -- a gutshot straight. Andersson showed for a set of fours. Welch was drawing live to the winner, but missed the river with the . He's down to 27,600. Andersson is now on 79,000. Currently there are only 21 players remaining in the field as we head into the final level of play. With an hour to go, some players will be looking to survive, while others look to accumulate. Who will come on top? Stay tuned to PokerNews as we provide live coverage of the final hour of play. 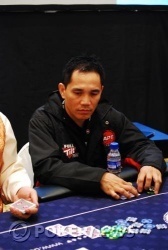 Norihito Suzuki limped the small blind and Neil Arce made it another 2,000 to go from the big blind. The flop fell and Suzuki check-called a 4,000 from Arce. When the landed on the turn, Suzuki again checked to Arce who fired out 5,000 this time. Suzuki made the call. The river went check-check and Arce flashed the . Suzuki mucked and Arce was polite to show his kicker as he raked in the pot, which sent him back to 38,000 as Suzuki remains strong on six-figures. Hyoung Jin Nam made the final table of a major tournament here in Manila just two months ago, but won't have a repeat this weekend. He was all in on a flop of with . His opponent, David Welch, called and turned over pocket queens, rose out of his seat and started shouting for them to hold. Queens held when the turn and river blanked out. "Go on, English!" said tablemate Eddie Hearn. He offered Welch a high five, then asked, "Are we the only two English left?"